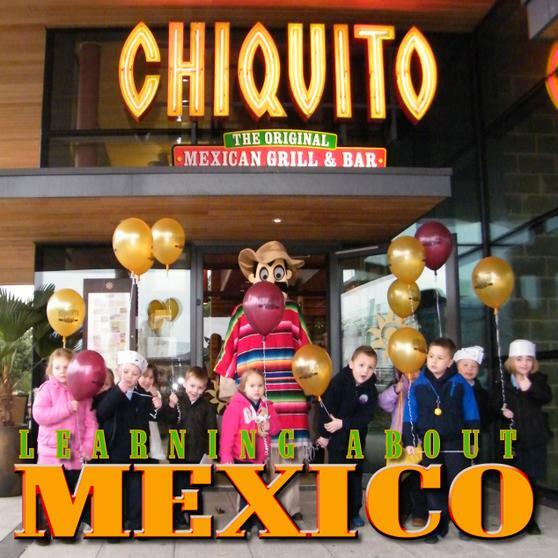 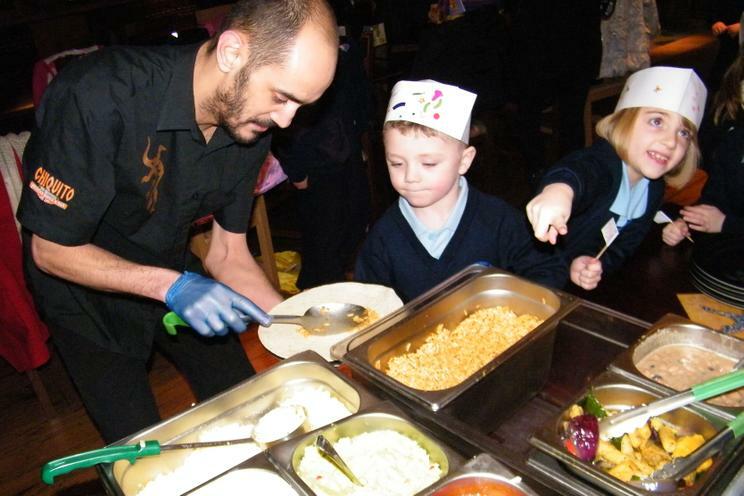 We have been having great fun learning about different countries around the world, whilst we would like to visit we are not sure if our minibus is up to it but we did manage a fantastic visit to Chiquito's restaurant down in Cardiff Bay. 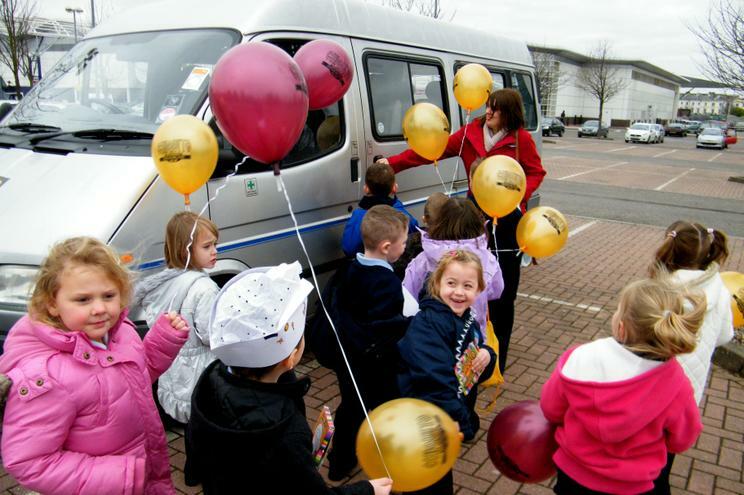 On the way the children were chanting "We are on our way to Mexico" as they left Millbank. 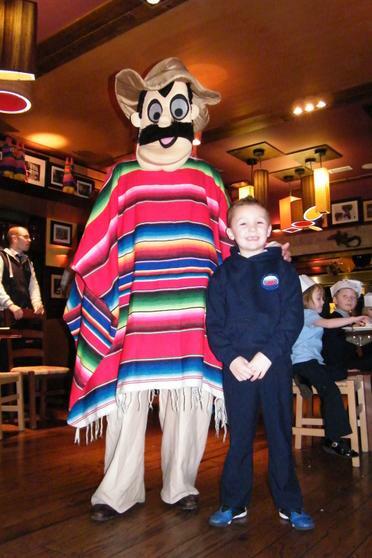 When we arrived we were greeted by Adam, Geraint and Ruy who taught us that the main language in Mexico is Spanish and told us how to say hello "Hola." 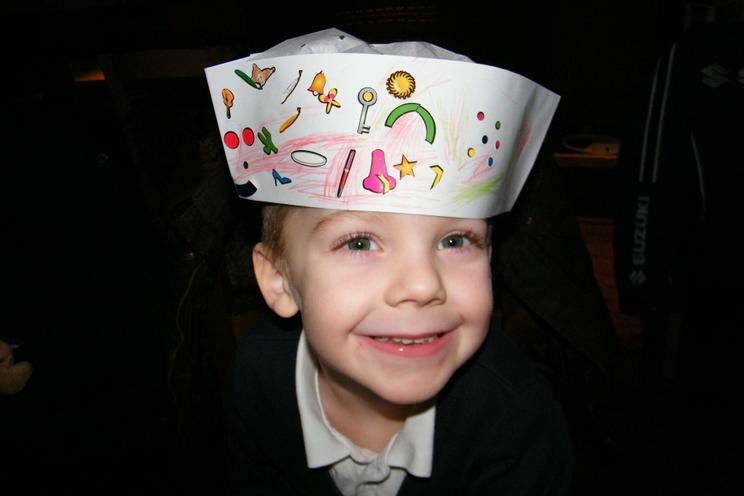 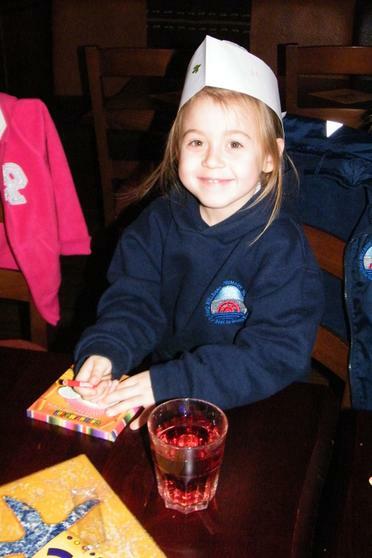 We all had paper hats which we had to decorate with the pencils and stickers that we were given in the goody bags ( yes we were being spoilt - it was fab!) 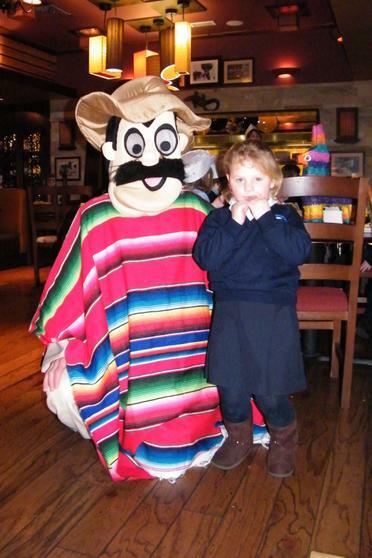 Some of us coloured in pictures of Mexico or our names, we even did a little hat for Millie Banks our mascot. 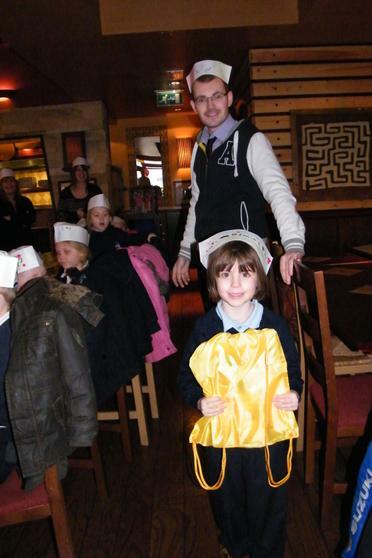 The best one was given yet another goodie bag by Adam this back pack contained books and even a camera- wow! 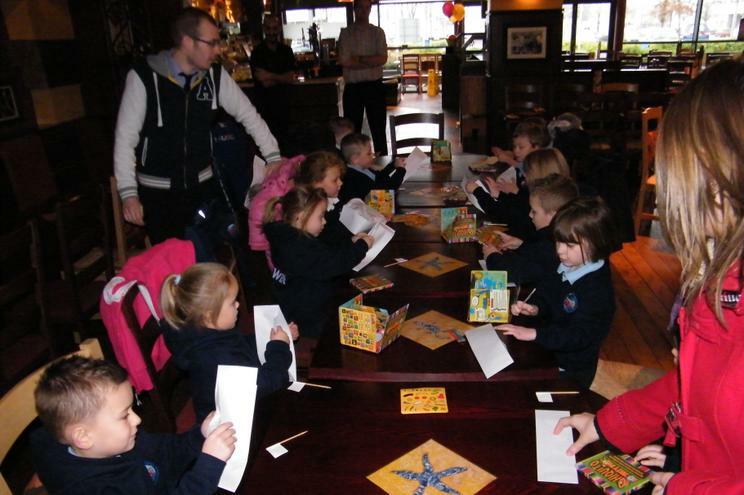 We also coloured in little flags with our names on to use later. 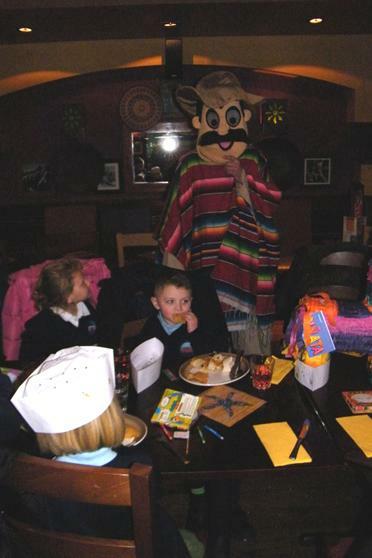 Then Adam told us all about Mexico and gave us some important facts to remember such as Mexico is where Vanilla flavour originally comes from, as doeschocolate, peanuts and baked beans. 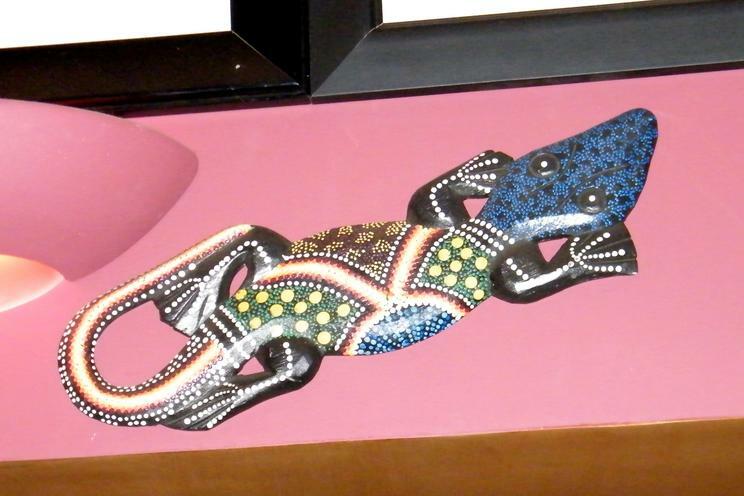 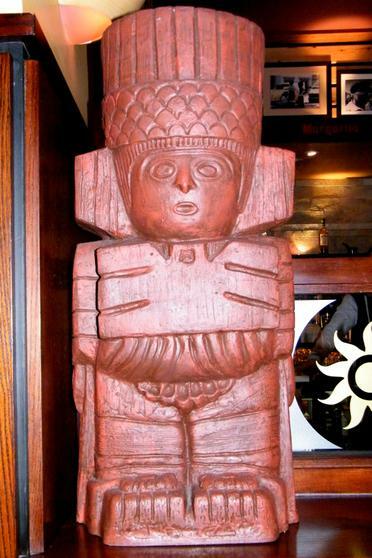 Mexico City is the capital of Mexico, it is one of the most populous cities in the world. 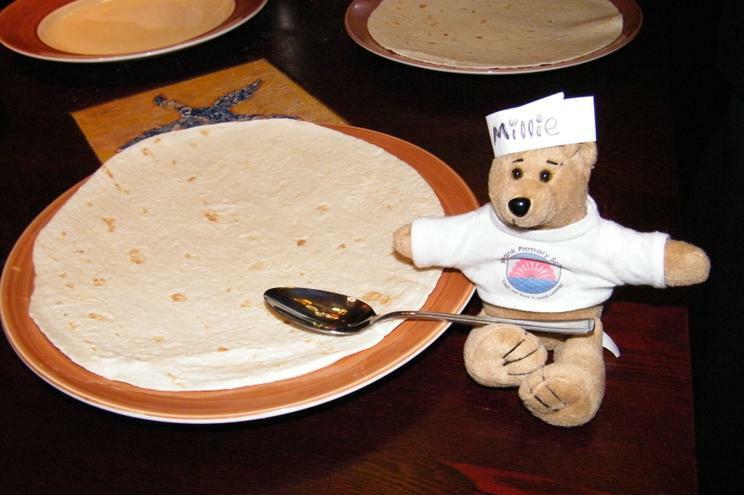 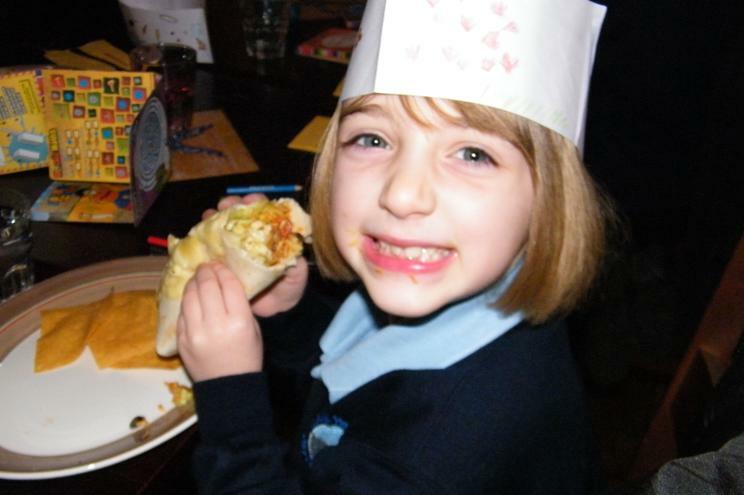 Once we have all washed our hands again Adam told us that we were going to make a special type of sandwich from Mexico called a BUTTITO, even the Aztecs hundreds of years ago used to make these little parcels of food containing different ingredients and flavours. 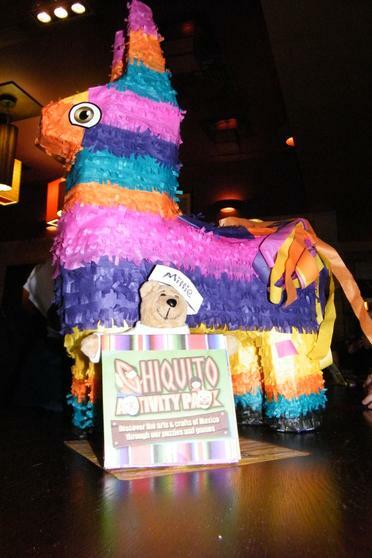 Did you know BUTTITO is Spanish for "Little donkey" (and might be because of the folded up packs they used to carry.) 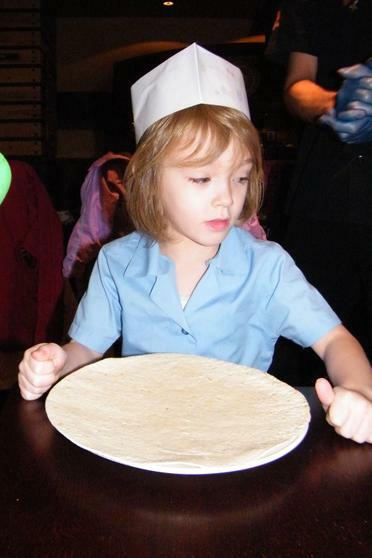 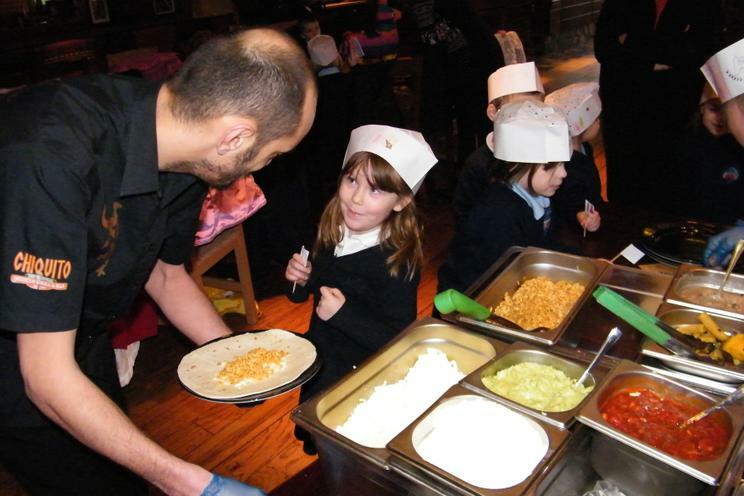 Adam tells us about the different ingredients that we can have as fillings for the main tortilla flat bread. 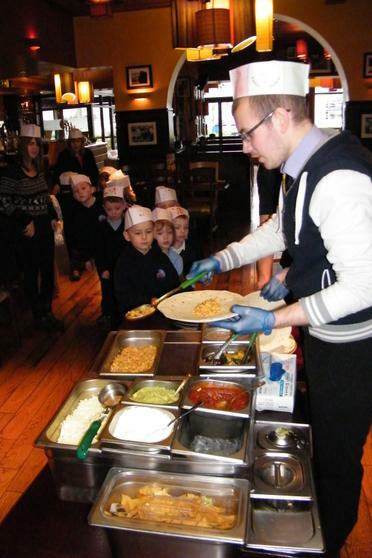 Adam Ruy and Geraint helped us make our own special burrito with whatever ingredients we would try, some of us were very adventurous, some not so, but each burrito we made was an individual just like us! 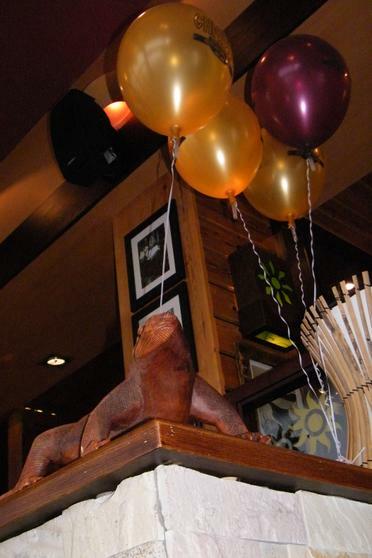 We popped a little flag on top with our name on it so we knew which one was ours. 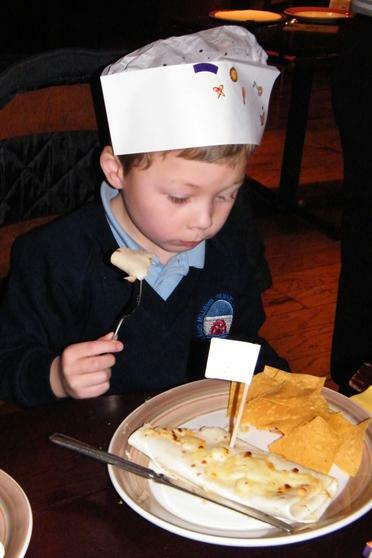 Ruy took them to the chef in the kitchen and popped them in the oven for us. 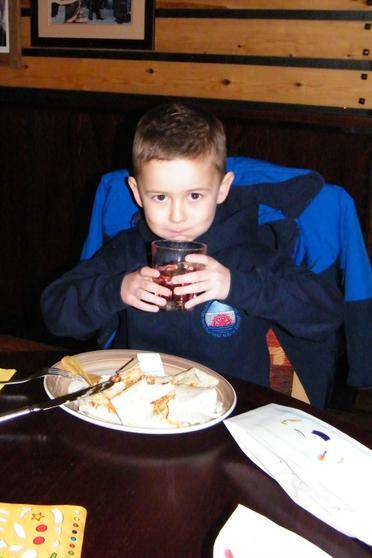 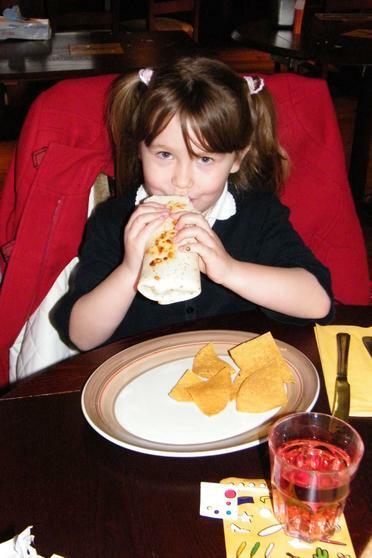 We had our burritos with a glass of the house red (ribena) we all thoroughly enjoyed them. 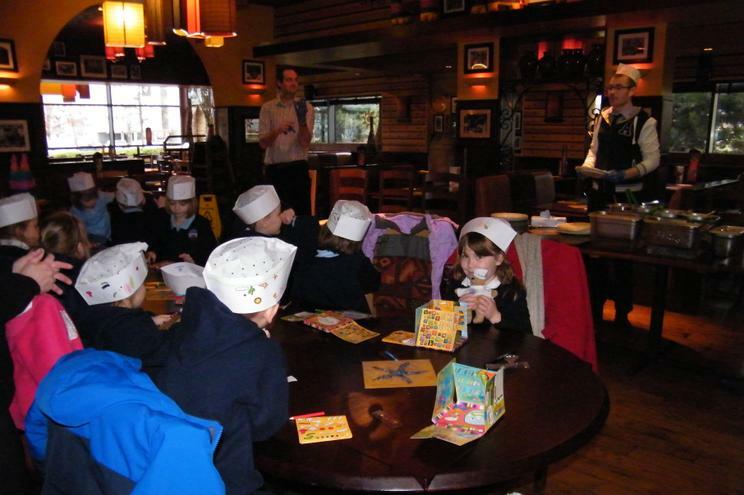 We put a bit in our weekly newsletter about the visit and gave out a book of vouchers(kids eat free etc) to the parents too. 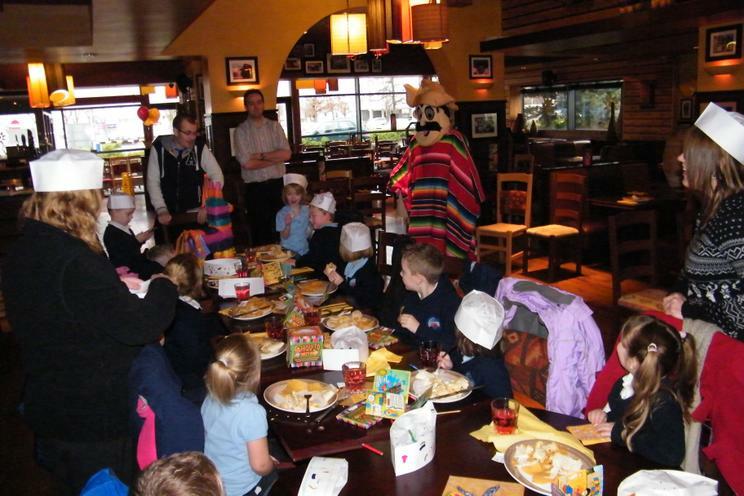 After the visit we try and remember all the amazing facts about Mexico. 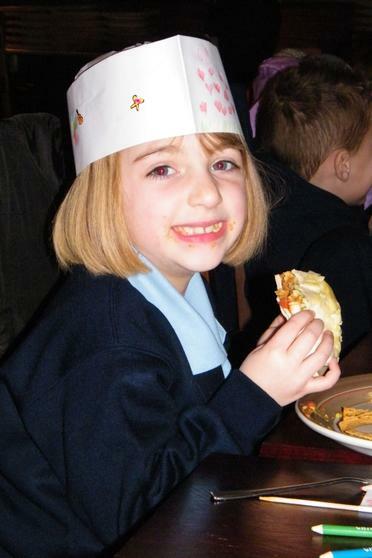 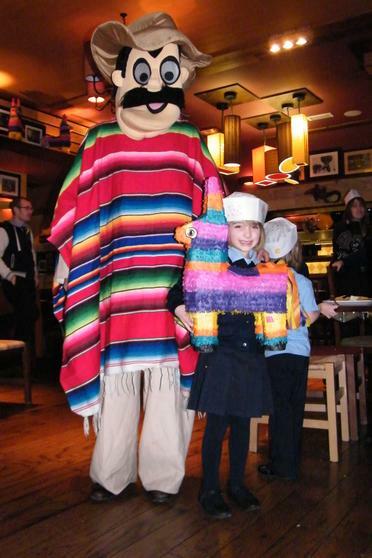 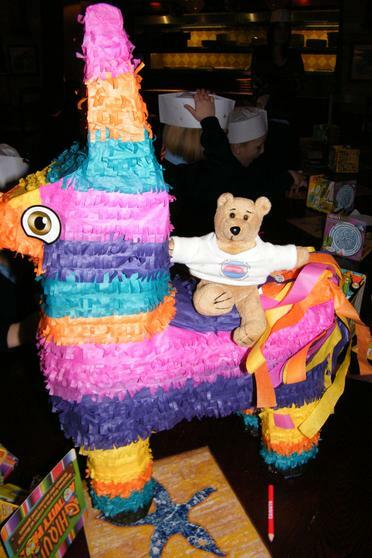 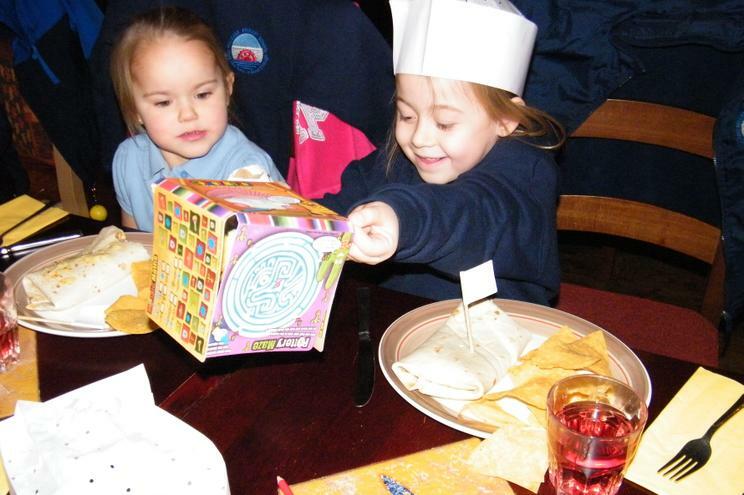 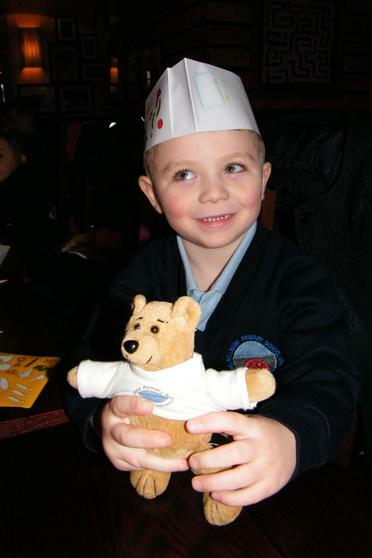 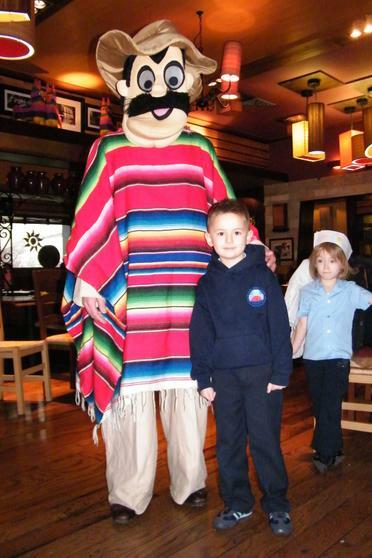 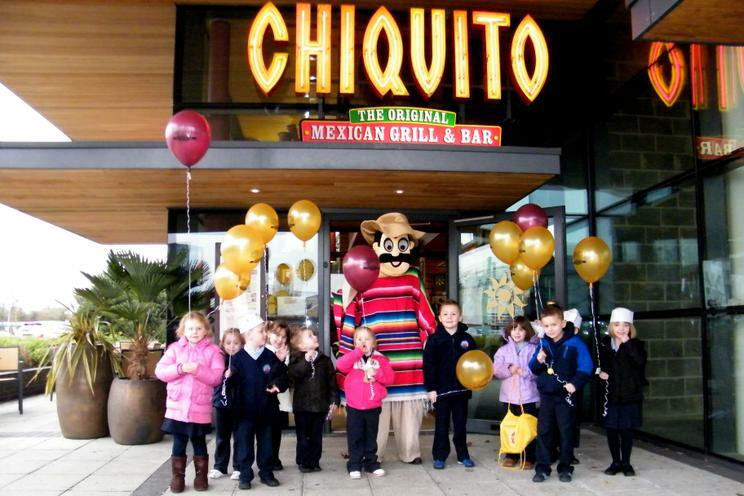 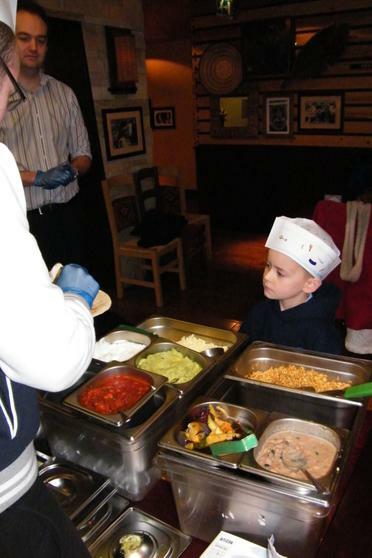 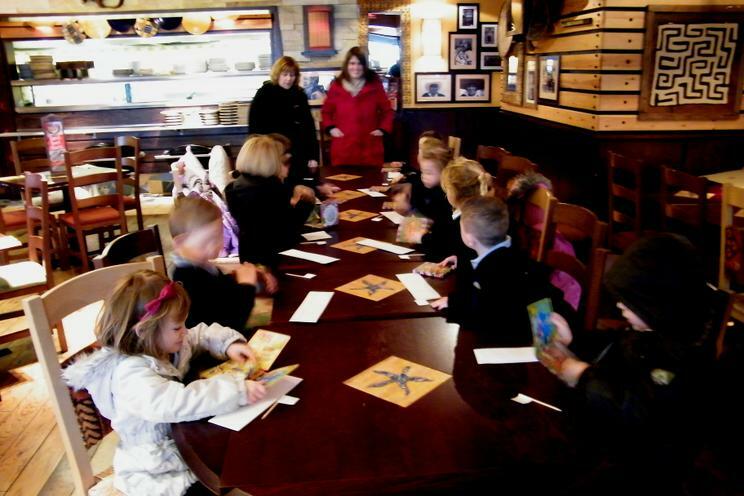 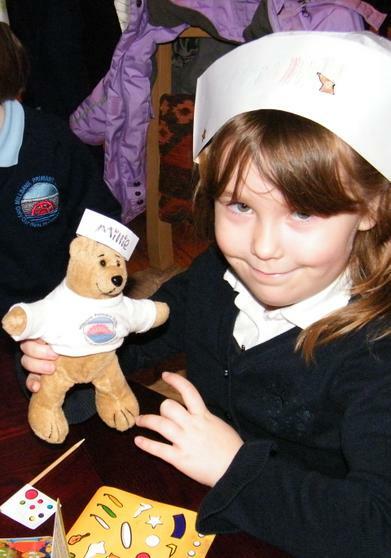 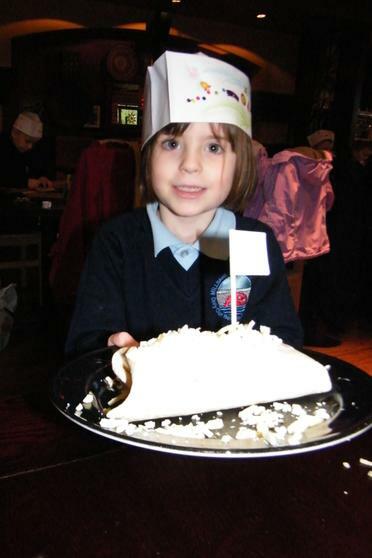 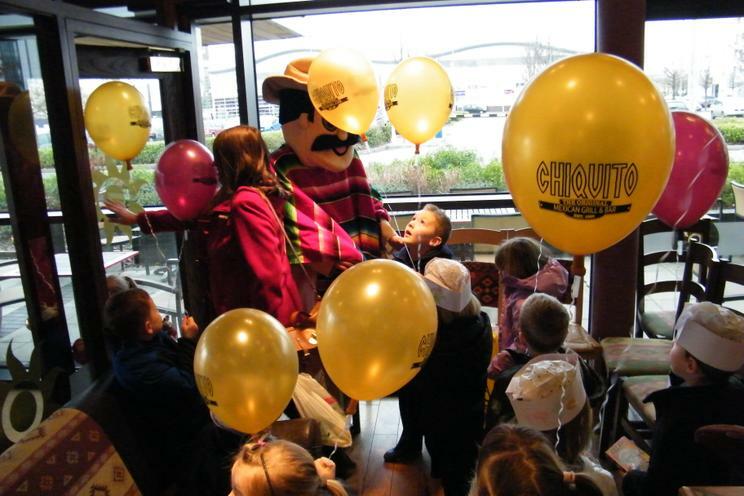 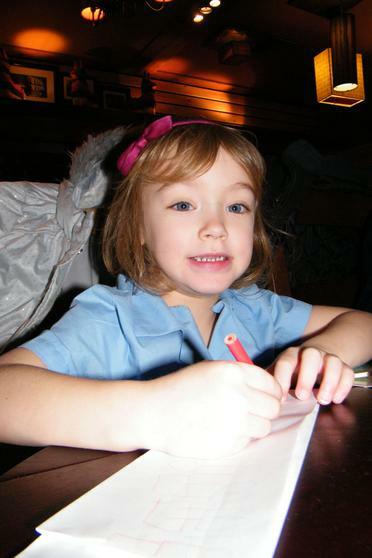 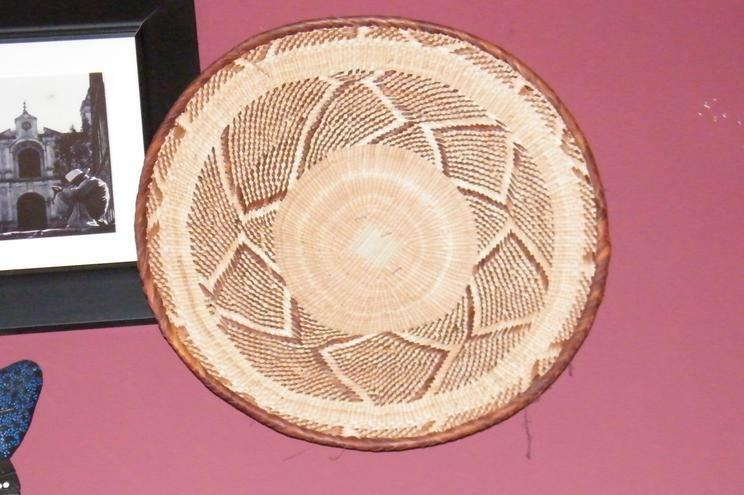 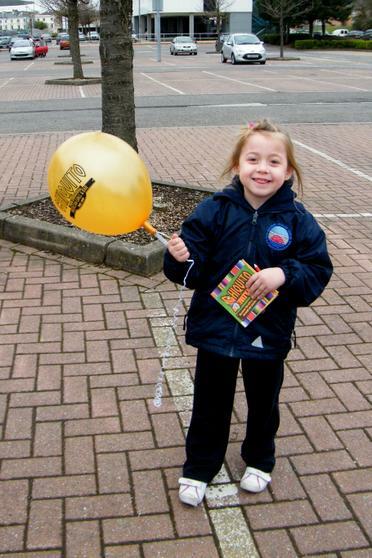 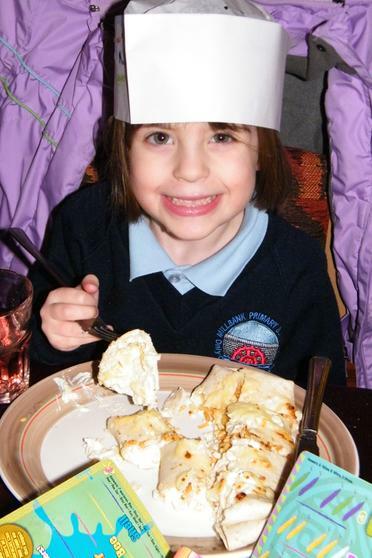 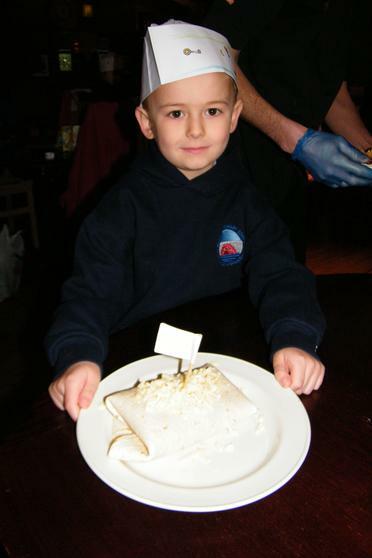 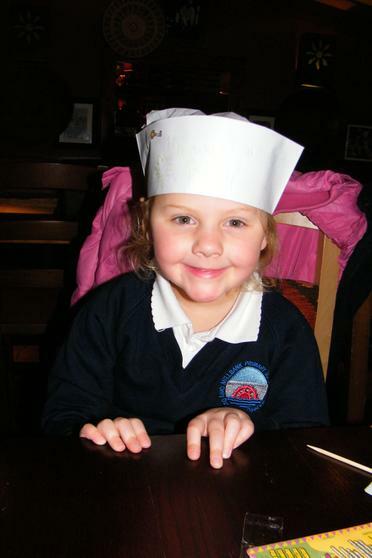 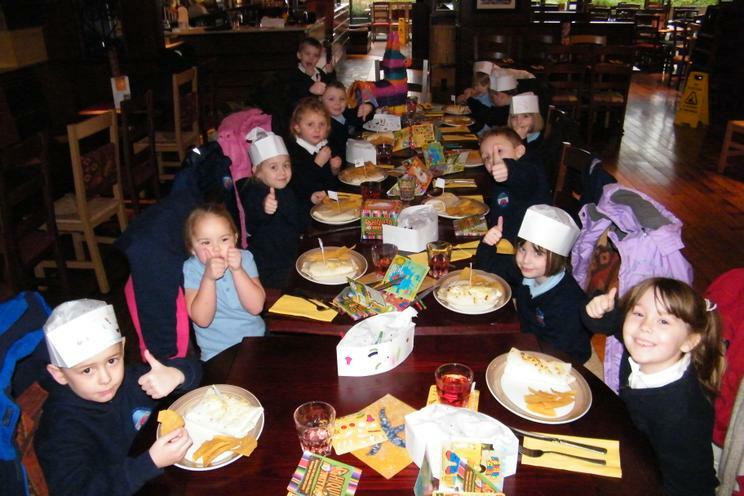 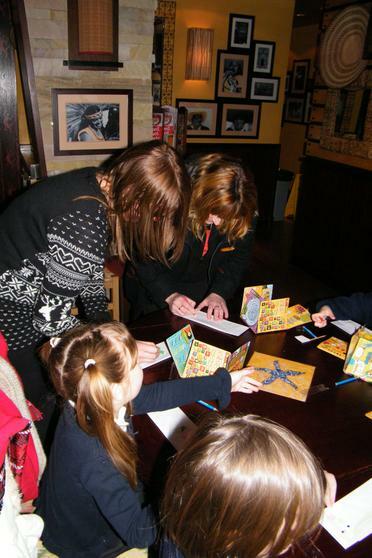 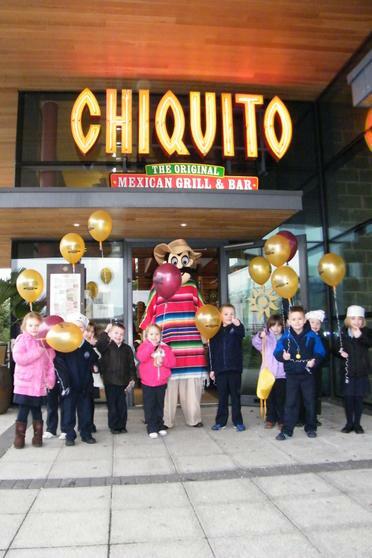 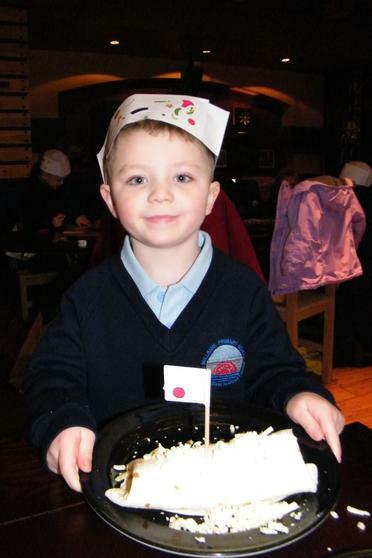 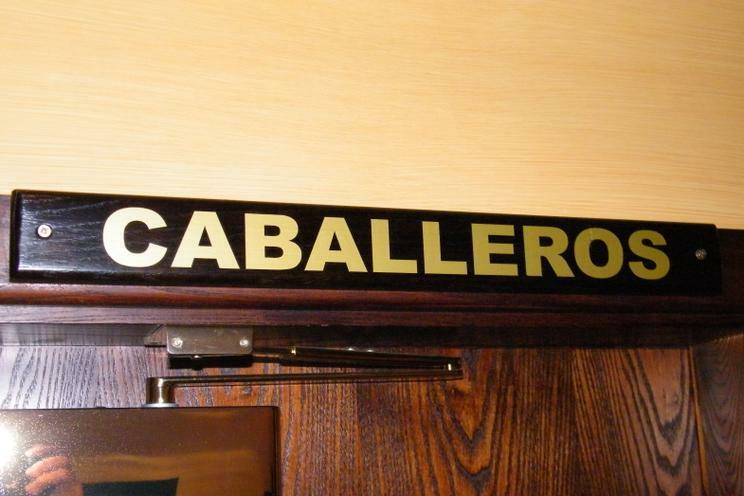 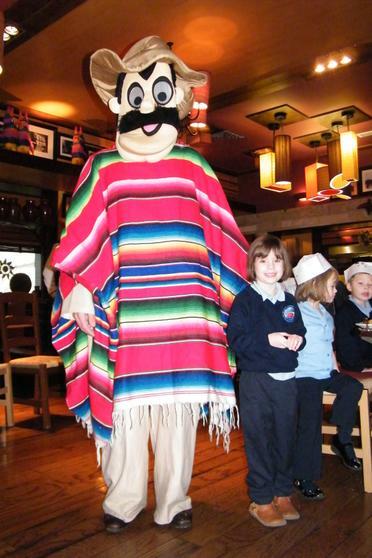 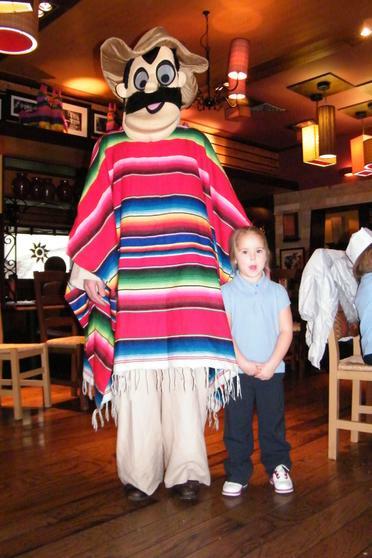 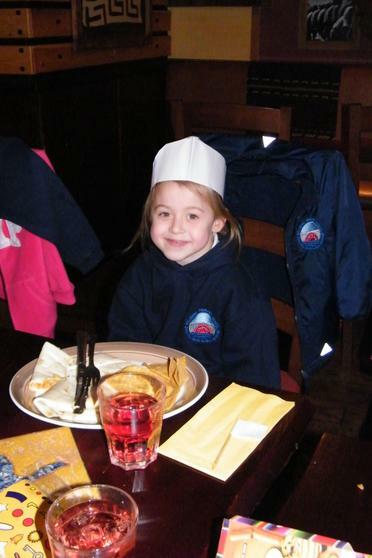 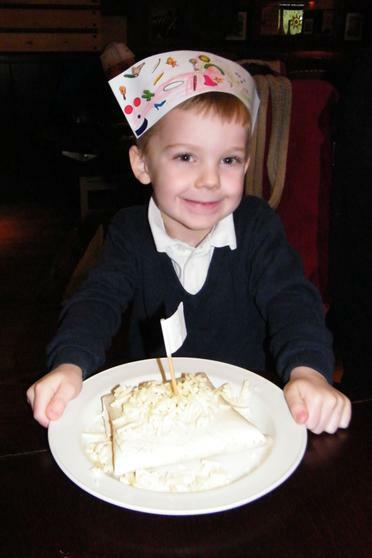 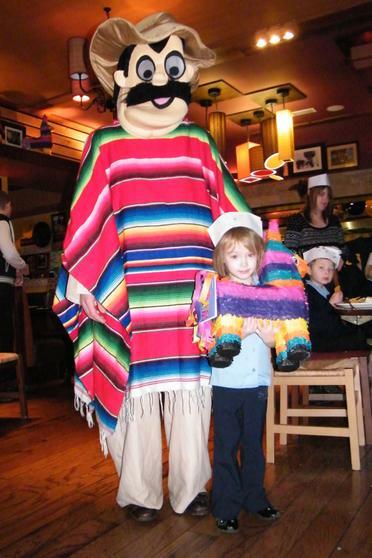 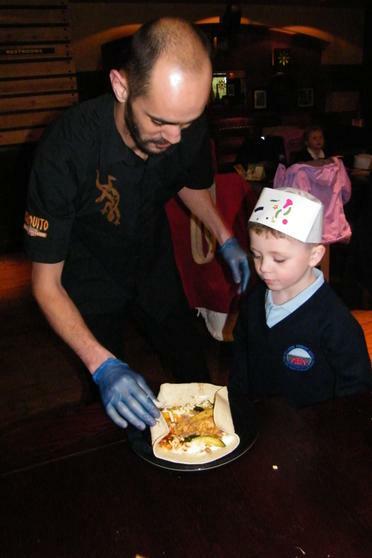 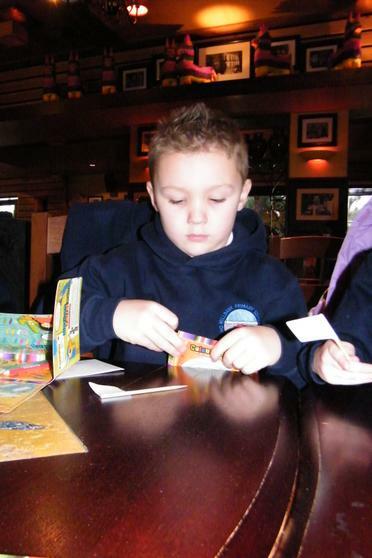 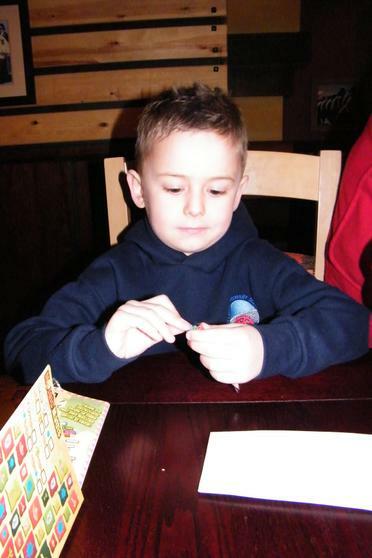 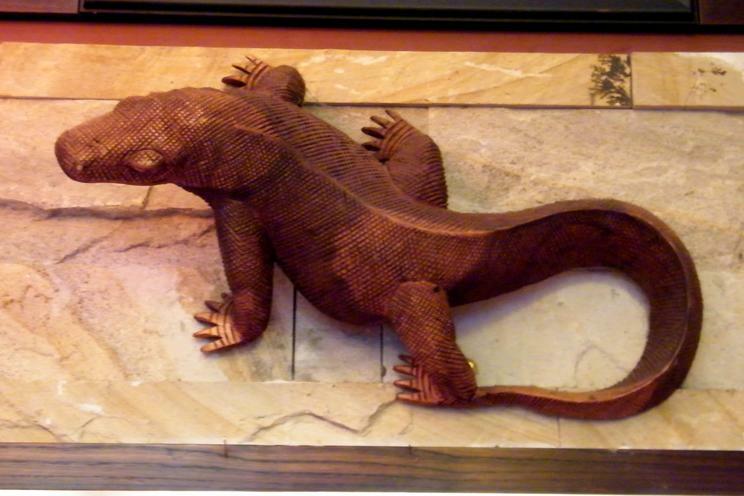 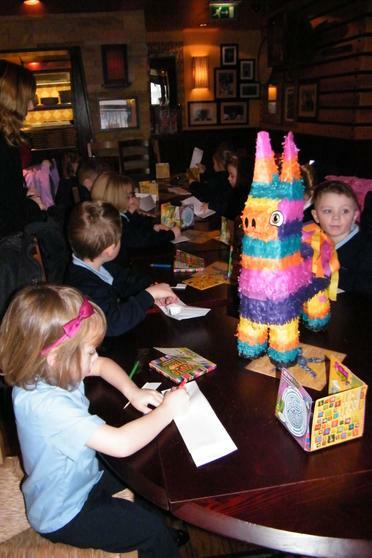 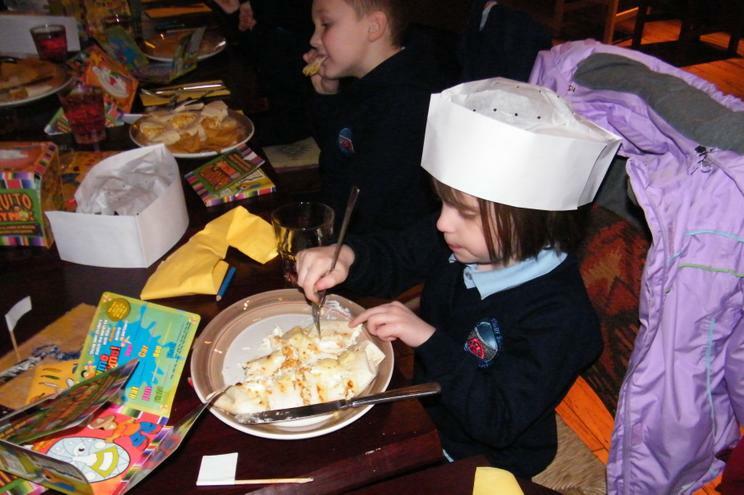 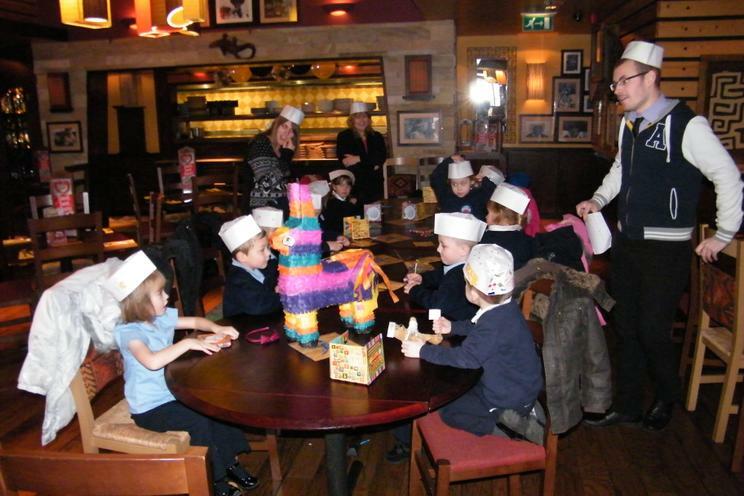 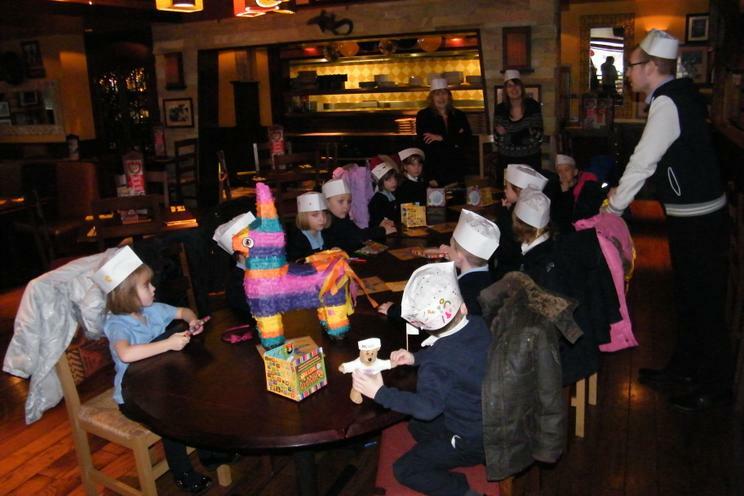 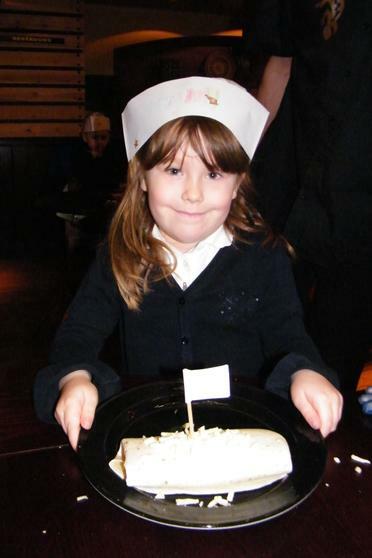 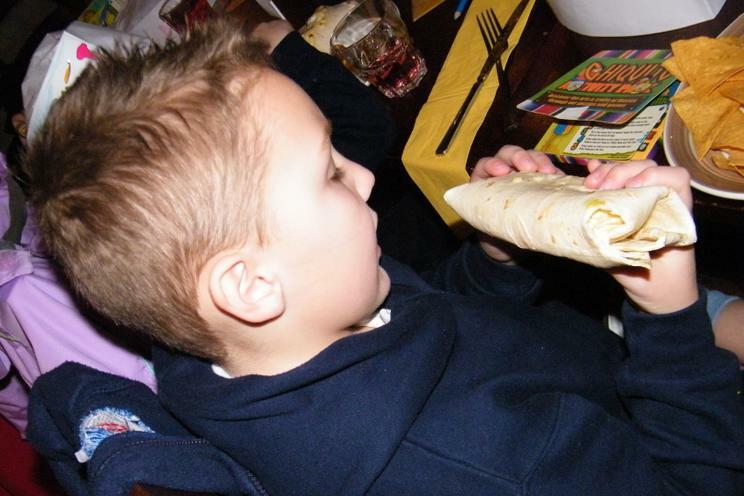 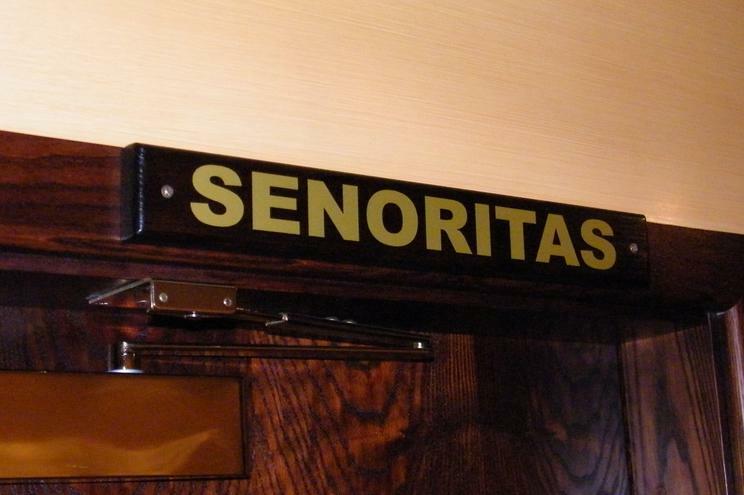 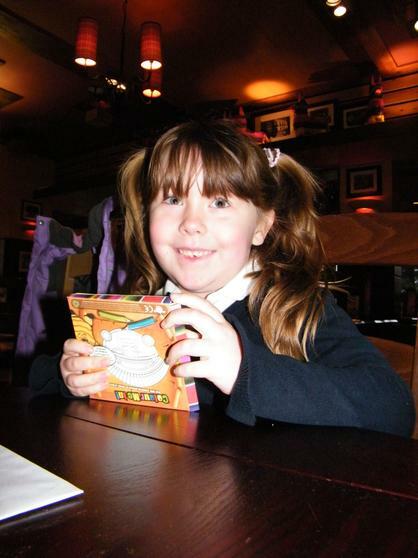 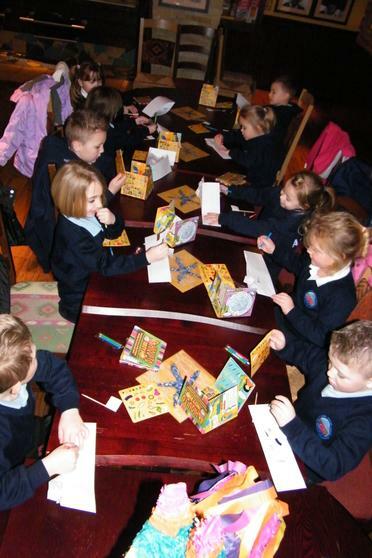 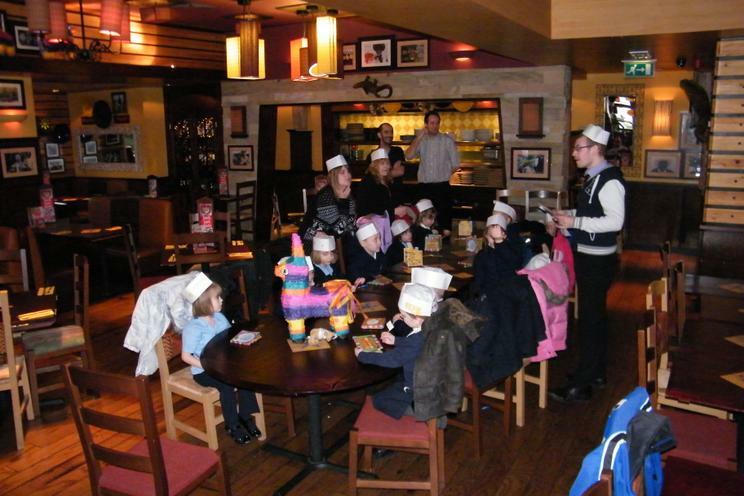 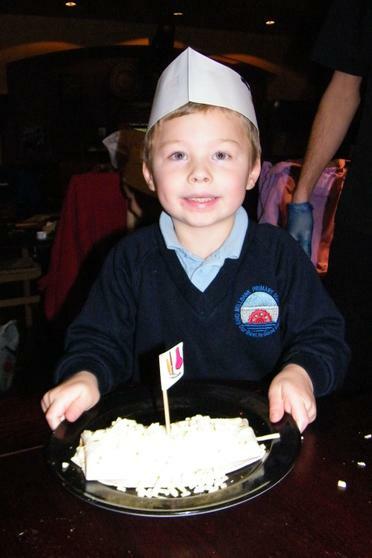 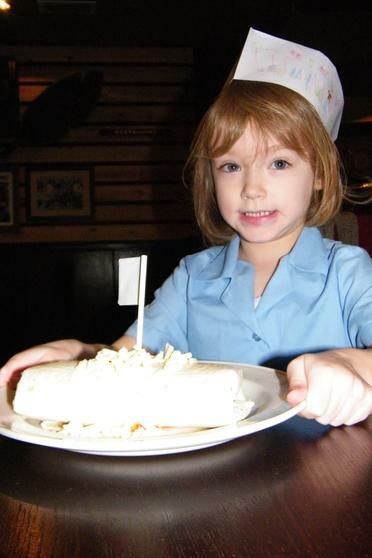 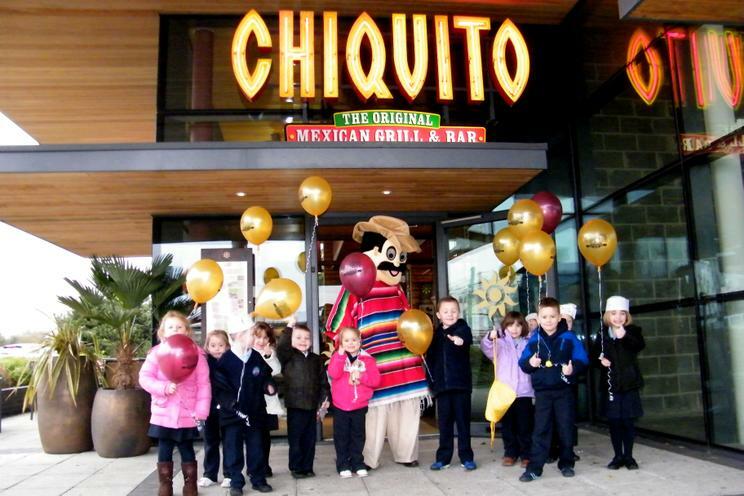 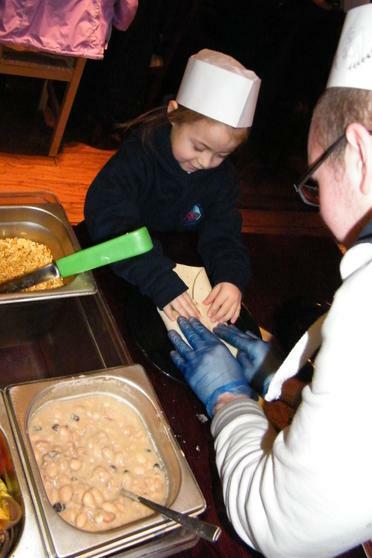 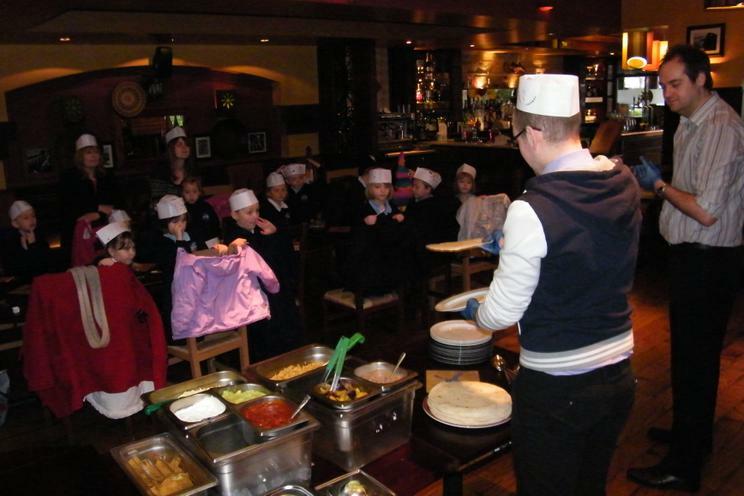 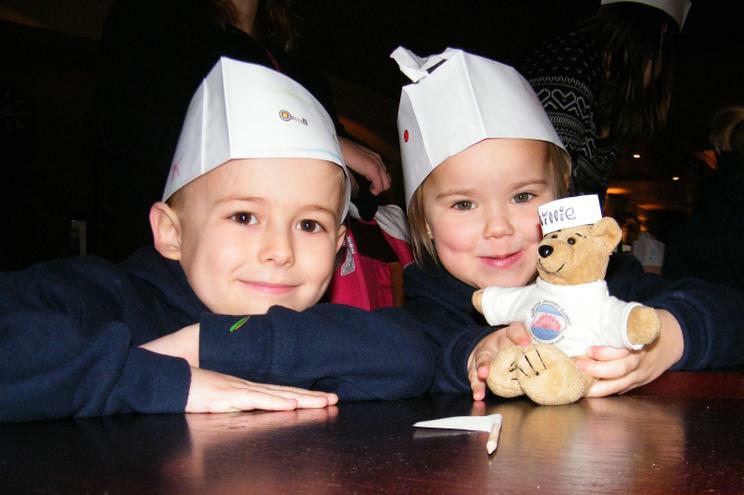 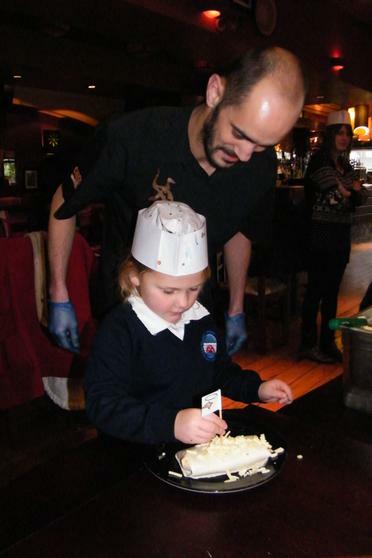 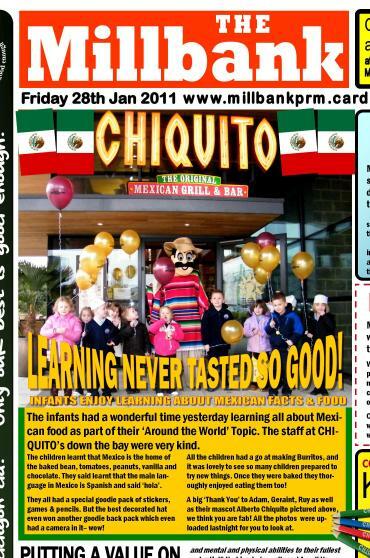 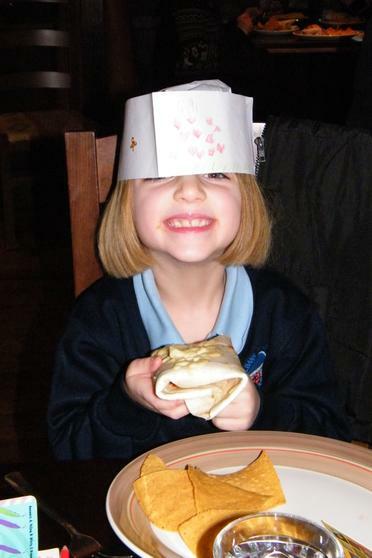 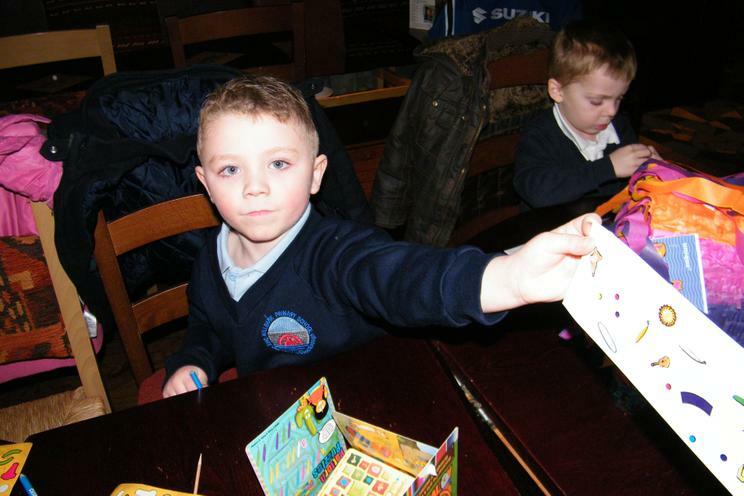 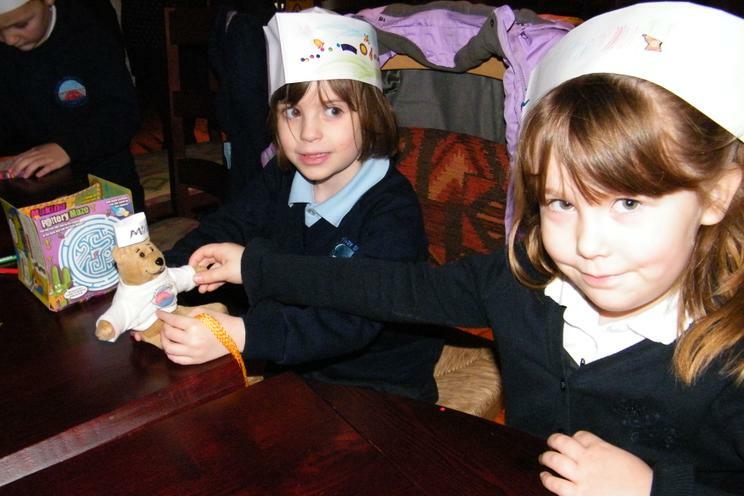 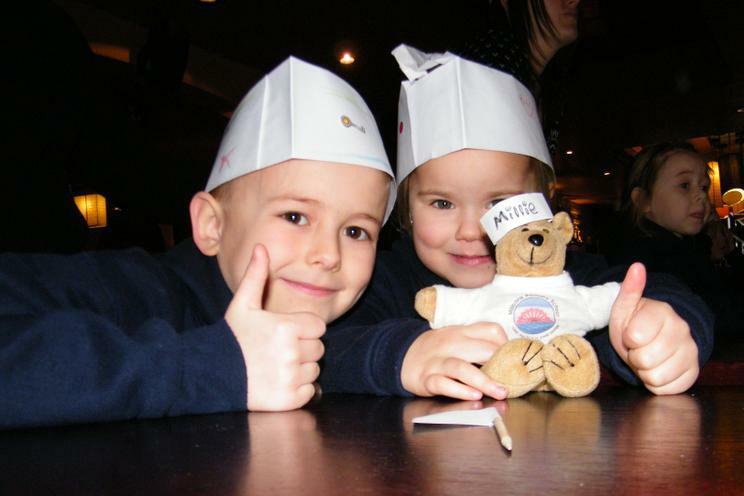 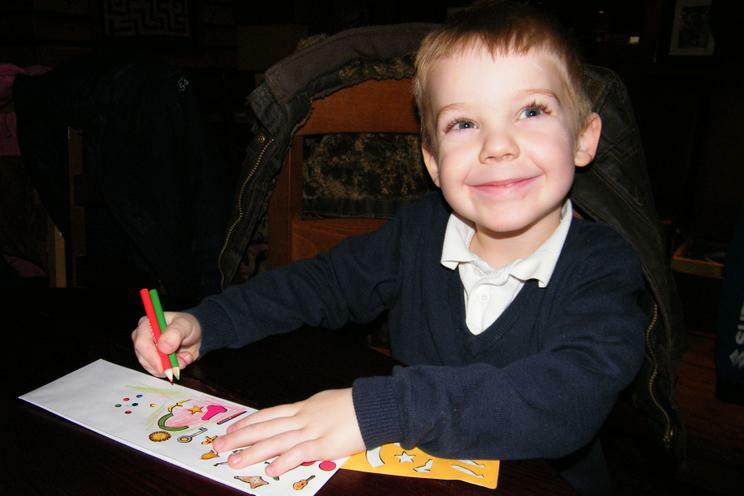 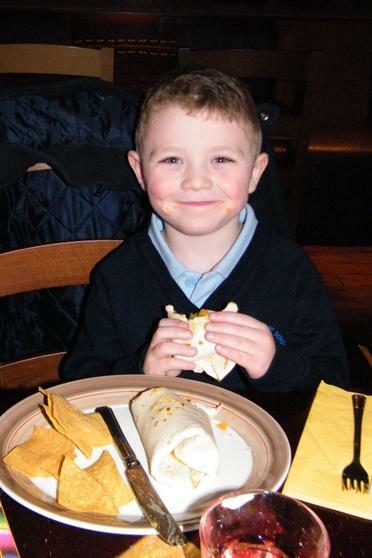 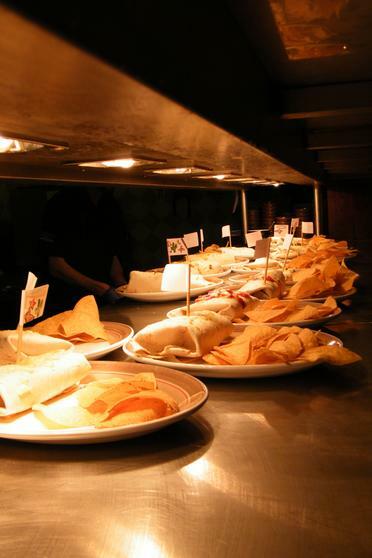 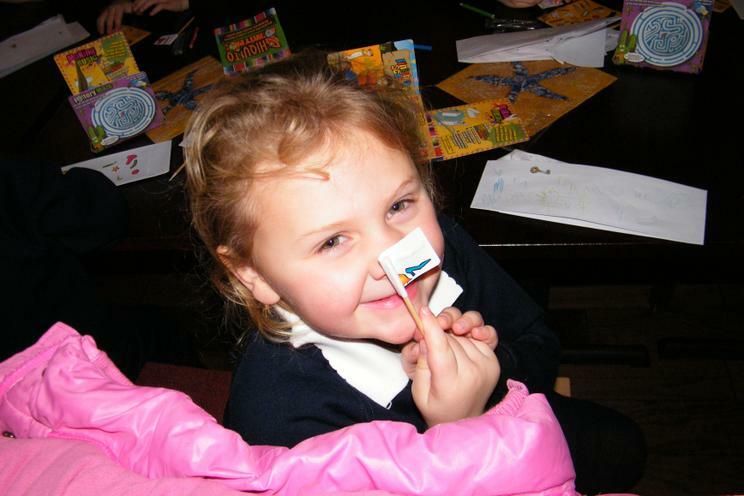 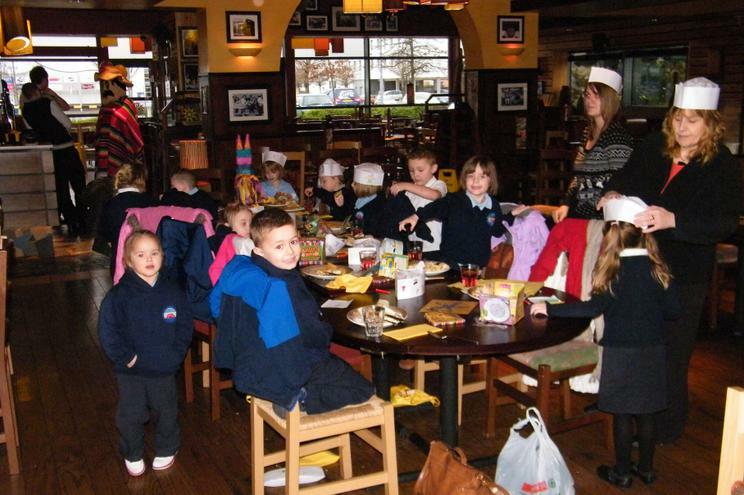 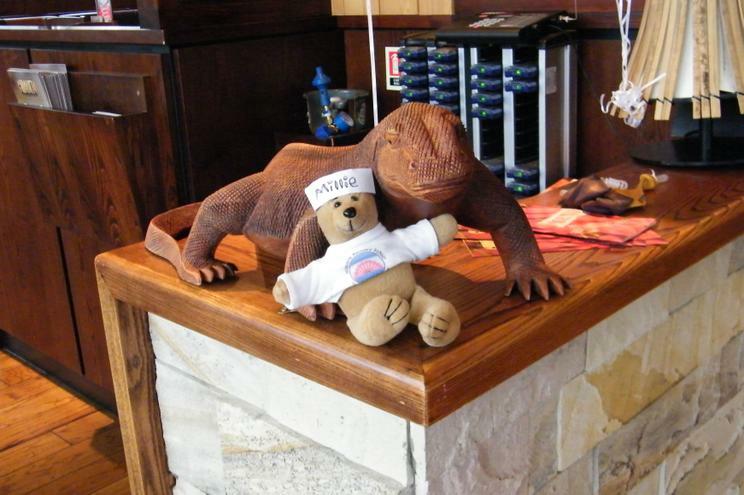 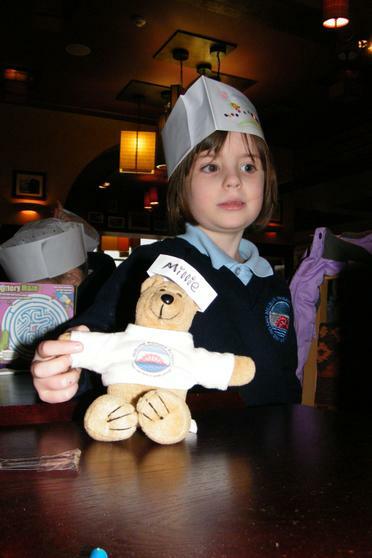 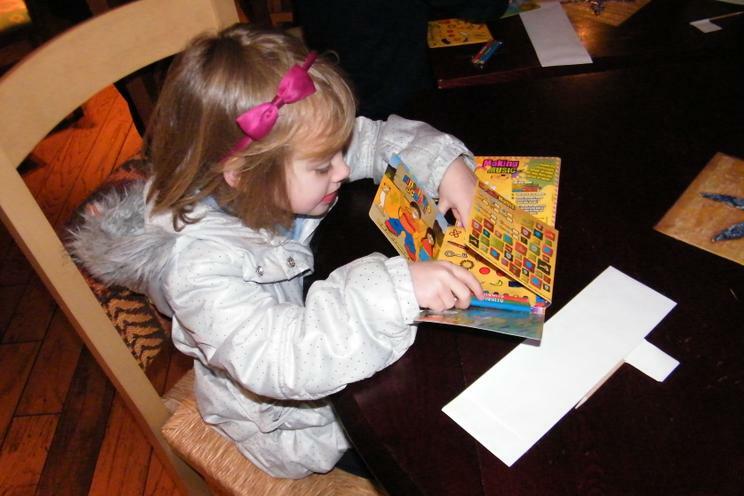 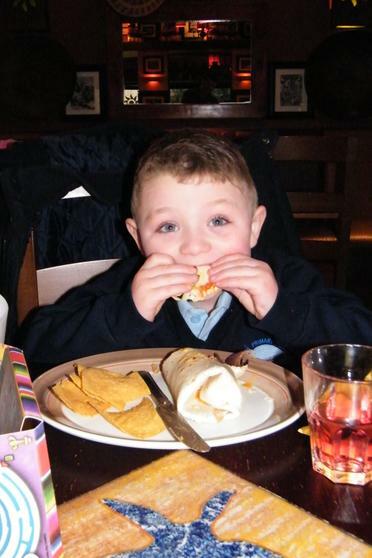 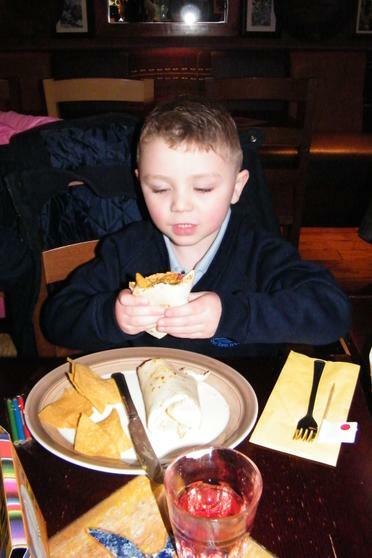 We also will remember what a lovely time we had a Chiquito and what lovely kind people they are to help us in this way. 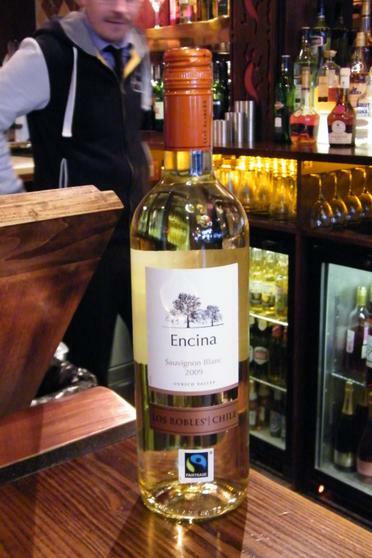 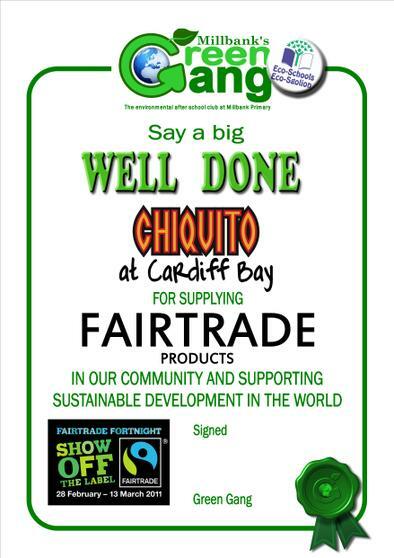 We are doing lots of work around Fairtrade and we asked if they have any Fairtrade products, they showed us some of the lovely wines that they stock so we told Green Gang who are part of the Fairtrade steering group and they made a lovely certificate to say thank you. 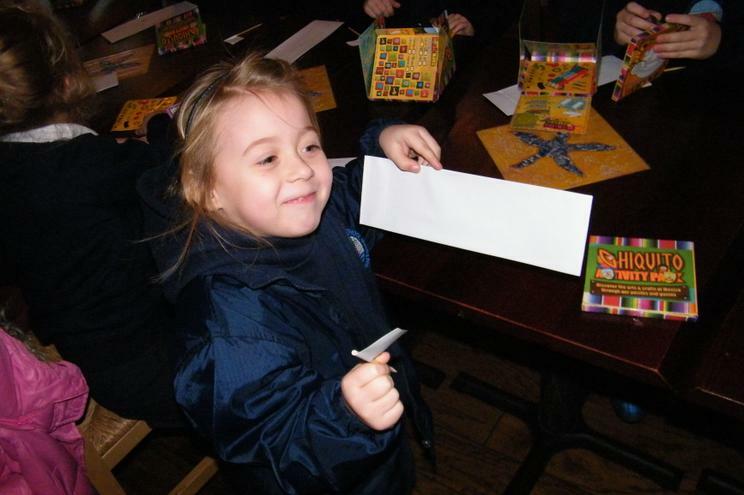 We put this in the card that we made for them. 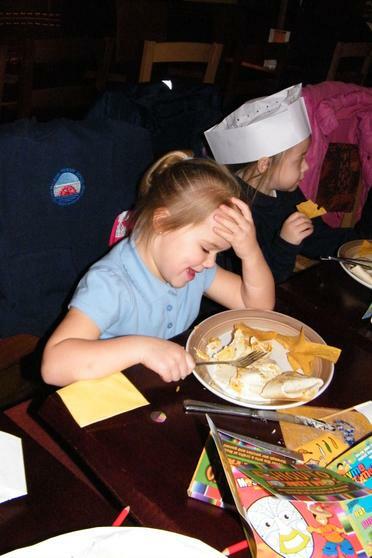 We had wanted to sent them some of the photos but the schools websites and e-mails were down for some reason for a whole week. 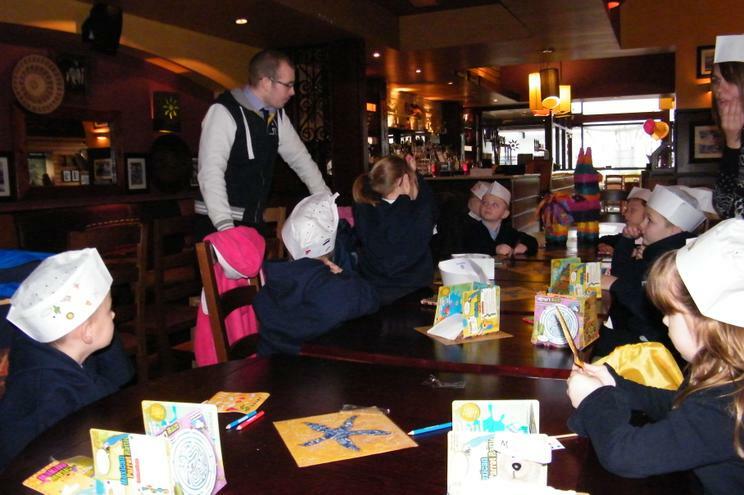 We say a huge thank you to Adam,Geraint and Alberto as we leave (Ruy had strangely disappeared just before Alberto came to see us) and a big thank you to the lovely Miss Clissold & Mrs Jones for taking us and giving us a real taste for learning.